On January 22, 2019, the U.S. Supreme Court had not announced whether it will take up a lawsuit during this term over President Trump's effort to end the DACA program. This means that the Court won't take the case until the fall, which also means that the ruling would not come before 2020. Thus, the November 11th ruling by the 9th Circuit Court of Appeals, which upheld a ruling that blocked the Trump administration from ending the DACA program is still in effect. The nationwide injunction allowing the Deferred Action for Childhood Arrivals program to continue continues. While DACA is still currently legal, this ruling has not changed who is eligible to apply for the DACA program. If you have not had DACA in the past, you still cannot yet apply. If you have previously been granted DACA and remain eligible, you can still apply. U.S. Citizenship and Immigration Services is currently accepting DACA renewal applications, as well as applications from DACA eligible community members whose DACA status has expired. 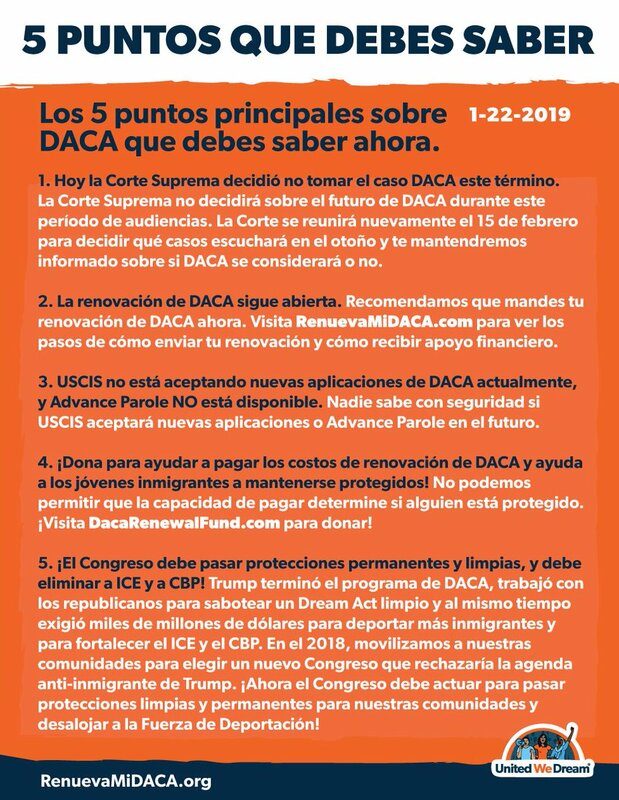 Northwest Immigrant Rights Project (NWIRP) and Colectiva Legal del Pueblo occasionally organize DACA renewal clinics in Seattle and across Washington. If you are a current DACA recipient, we also recommend that you consult with an immigration attorney or accredited representative to explore whether you might qualify for another pathway to obtain immigration status. If you live in King County or work in Seattle, you may qualify for Seattle-King County Immigrant Legal Defense Network services. Go here for details. You can search for an American Immigration Lawyers Association (AILA) attorney here. More information at the USCIS website here. If you previously received DACA and your DACA expired on or after September 5, 2016, you may file a DACA renewal. If you previously received DACA and your DACA expired before September 5, 2016, or your DACA was previously terminated at any time, you cannot request DACA as a renewal, but you may file a new initial DACA request. Pay appropriate $495 fee or approved fee exemption request and file your DACA renewal at a USCIS designated location: uscis.gov/i-821d-addresses. If you need financial assistance for your renewal, visit 21progress.org/byd. USCIS will not accept or approve advance parole requests from DACA recipients. To avoid the delayed delivery of DACA renewal forms that happened last year, some legal organizations are recommending using courier services that deliver the application directly to USCIS offices, instead of to the P.O. box. The DACA situation can change at any moment. 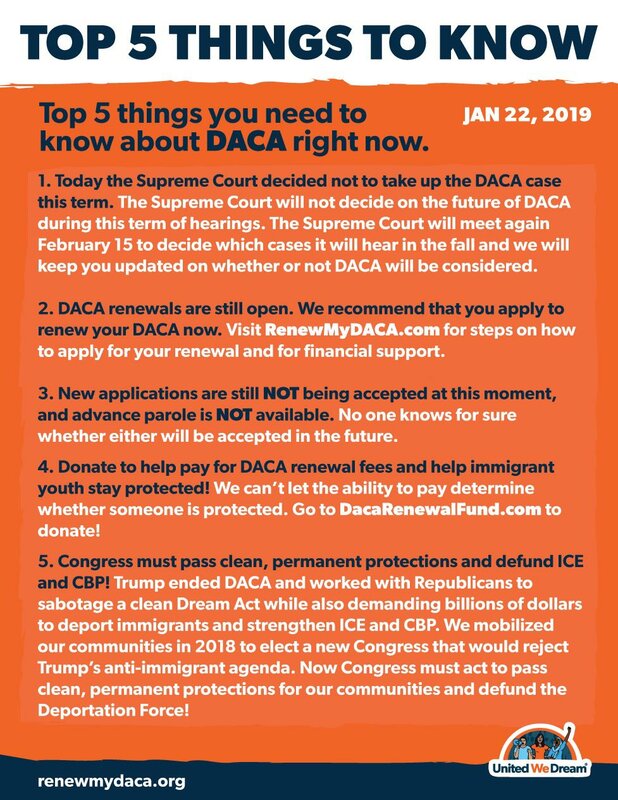 We recommend you stay informed of the latest DACA news by following this national youth-led advocacy organization: United We Dream. You can also visit informedimmigrant.com for additional guidance and information on how to renew your DACA status. Deferred Action for Childhood Arrivals (DACA) was established by President Obama in 2012. It granted a form of temporary relief from deportation known as "deferred action" to undocumented youth who came to the U.S. before the age of 16, resided in the U.S. since June 2007, and met other requirements. More than 800,000 undocumented youth nationwide received this temporary relief. In Washington, approximately 18,000 undocumented youth are DACA recipients, and we estimate about one-third to half of them live in Seattle-King County. On September 5, 2017, the Trump Administration announced that it would be ending the program as of March 5, 2018. On January 10, 2018, a federal judge in California temporarily blocked the Trump administration's decision to end the Deferred Action for Childhood Arrivals. On January 16, 2018, the Justice Department filed a notice of appeal with the 9th US Circuit Court of Appeals and said it will also take the "rare step" of filing a petition with the U.S. Supreme Court. Then on February 26, 2018, the U.S. Supreme Court declined that White House request, leaving the 9th U.S. Circuit Court of Appeals temporary injunction in place. You can download the flyers and infographics by right-clicking on them and then saving to your desktop.